New York is a city of outlandish wealth and extreme deprivation, where the abundance of high-rise office space and luxury housing belies a poverty rate of nearly twice the national average. 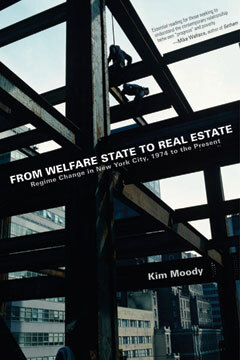 In From Welfare State to Real Estate, prominent labor activist Kim Moody argues that the city’s business elite has tilted the political structure toward an agenda that puts real estate development ahead of human needs. The result is a new Gilded Age in America’s first city, overseen by the nation’s first billionaire mayor. Tracing this trend to its roots in 1975, when New York’s once-generous welfare state was abandoned during a time of financial crisis, Moody shows how business leaders managed to seize an unprecedented degree of influence in local politics. From Koch to Bloomberg, the developmental bulldozer has extended its reach, placing more pressure on the city’s beleaguered and divided working class. From Welfare State to Real Estate offers the first historical narrative of the key turning points in this process, from the redevelopment of Times Square to the fight over Brooklyn’s Atlantic Yards. It looks beneath the skyline to analyze the power struggles that have shaped this global city in the twenty-first century.